I can clearly remember when my interest was sparked by the liberation events that took place in St. Georgen, Austria, during World War II. An Austrian historian had invited me and my friends into her home, serving tea and bread, meat and cheeses. It was the end of a long day of travel, and I secretly desired a hot shower and a soft bed. But it wasn’t long before our host had me intrigued with her true tales of villains, prisoners, and GI heroes. I sat—eyes wide—as Marta described the twenty-three American GIs who had stumbled upon the Gusen camps May 5, 1945. I imagined their horror as they witnessed prisoners reduced to skin and bones. Or worse, piles of corpses. But Marta also spoke of other things, such as the first help to enter the camp: a young Nazi wife with her children in tow. Who was she? I wondered. Obviously, she had not believed in the Nazi persecution. What would it have been like to witness such horror helplessly? How was her life forever changed? I also imagined those prisoners who were mere days from death. How did they go on after facing such hatred, such loss? Just the night before, on a dinner cruise in Prague, I had sat elbow-to-elbow with a young Jewish girl and her brother. Celebrate the 70th anniversary of the liberation of Mauthausen camp with @TriciaGoyer! “Fifty years ago, they would have been killed,” my friend whispered in my ear as we talked and laughed with our new friends. It was then that the horrors of WWII became real, and I knew I would never be the same. After we left Marta’s house that night, I turned to traveling companions—also fiction writers. “Are you going to write about this?” At that moment their no’s became my yes. I went home with much excitement and began researching the events concerning the liberation of Gusen and Mauthausen death camps. But I soon realized no articles or fuzzy black-and-white photos could ever take the place of speaking with those who were actually there. So in August 2001, I was invited to attend the 59th reunion of the 11th Armored Division. In Kalamazoo, Michigan, I spoke to the brave men, now in their 70s and 80s who had liberated the death camps. Their bodies have aged, but in their hearts they are still the same brave, young soldiers who witnessed so much. As the research progressed, I was also able to visit Austria a second time to participate in the memorial services celebrating liberation so many years prior. And while there, I spoke with others, including a man who was just twelve years old in 1945. I was awed as he led me through the streets where former SS houses still stand. And tears formed in my eyes as I stood before the guesthouse of the brave, Nazi wife, now gone. 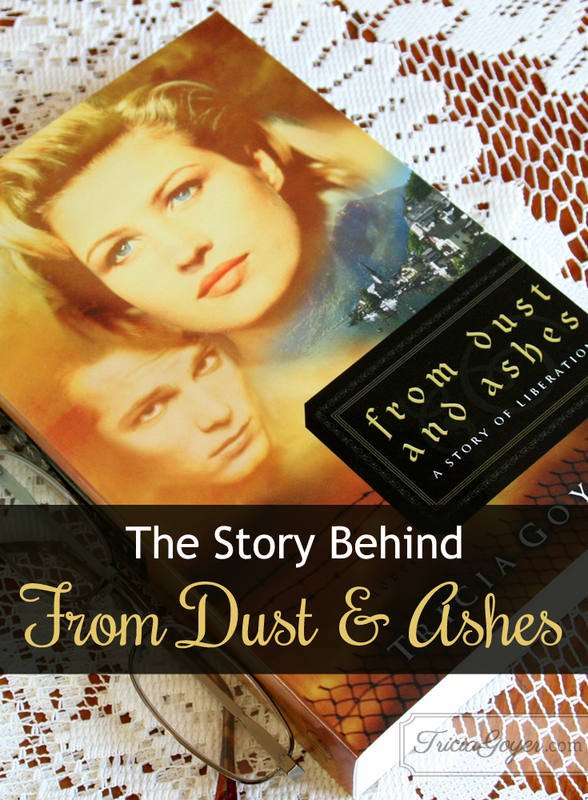 When real life inspires a #novel: @TriciaGoyer shares her experience. So fueled by memoirs, oral histories, and personal interviews, I began to write. And in my mind, the streets of St. Georgen and the events of 1945 soon became as real as life around me. On that sunny day in October, my greatest concern had been resting after a long day of travel. It was only later, after months of writing, that I realized God’s intentions were far greater. His plan was to have me share a story of liberation. A story inspired by true events . . . and true heroes. Share your favorite WWII or veteran story on your blog and link-up below! Hi. I’m Shirley Chapel and my Dad was a WWII vet. Born in England in 1913 he had immigrated to Canada where he met my mother and after dating for a reasonable period of time had married. By the time WWII broke out they had become a family with my two preschool sisters. Father volunteered to join the Royal Canadian Air force and was sent over seas . Mother went to work in a factory where they assembled high explosives and was very dangerous . After the war Dad returned home to Canada to join his family and resume his life again. He was not the same man he had been before the war. Things he had seen during the war stayed with him the rest of his life. After returning home from the war the family lived in a small apartment over a warehouse . Near by the Fire Sation was located . Every time there was a fire an alarm would sound out and Dad would gather his family together and make everyone crawl under the kitchen table, certain they were under enemy attack. Mom would explain to him over and over again that the alarm was a call out to volunteer fire fighters because a fire had broke out in the area , but the memories where just too real from his time spent overseas. Later years saw them in their first house. My brother and I had come along and joined the family. I can remember the night mares Dad had many times. I would hear him cry out in his sleep many years after the war. I can remember my elementary school aged brother playing war with his friends at our place. As in any war game there was of course the good guys and the enemies. The enemies being the Germans and good guys being the Canadian Soldiers. As little boys do they get very real in their games. The Germans where shouting Hyle Hitler as they marched along. Dad came out of the house and broke the game up and forbid them ever to say Hyle Hitler again. Dad was the silent type when it came to recalling his war years. It just wasn’t mentioned , ever! He didn’t March in any parades or go to any reunions that I can remember . Years and year after the second world war Dad received a small box of medals in the mail. He took them out and looked at them and after that they disappeared . The next time I saw them was at his wake in 2006. This is all I can remember about my Dad. A man that was willing to put his life on hold and go fight for his country . A man who returned home scared by his memories . He tried to return to normal life and succeeded but the memories never left him. While visiting my father-in-law several years ago, I came across two books he had recently received. One was From Dust & Ashes. I literally was hooked from page one and finished it before we left to go back home. I asked if I could take the other book, Night Song. Again, page one pulled me in. I have always loved reading historical novels based on facts — and was so moved by these books that I asked my father-in-law, Norman K Normandin, to share his memories of WWII. I learned he was in the 11th Armored Division and his unit was instrumental in liberating Gusen and Mauthausen. He told me how, when entering the town, they could smell death. The stench permeated everything. He explained how they dug grave sites the size of football fields and buried the dead in layers covered in limestone. Once he started talking and sharing, he opened up a bit more and shared some funny stories too. He even uncovered a short film that had real time pictures taken at both camps. I can only say I was saddened how poorly these innocent people were treated. A couple of years later I visited Washington DC and visited the Holocaust Museum. I honestly have never been affected by anything as I was at this museum. I was unable to talk afterwards because of the lump in my throat. I can imagine you would be affected the same way. What a moving experience. I love your stories and try to find each one when I visit my library. I appreciate your way of immersing the reader into a different life and time. God bless you Tricia — you truly are more than talented — you are gifted. Thank you for sharing this story and for witing theirs. I dont really have a favorite ww2 story. I wish I had more time with my grandparents, who probably could have told me about the liberation of the Netherlands but they didn’t talk about it a lot. I do like reading others’ stories though. I hope to take my children to see my birthplace in the Netherlands one day and to visit Anne Frank house and several other places I have only read about. Hi! I don’t know anyone who was involved in WW!! personally, but I’ve always been fascinated by all the stories out there. These are really hard stories to tell and I thank you for sharing other’s stories who may have a hard time sharing. My favorite story so far might be of Louis Zamperini which is who the movie Unbroken is based off of.